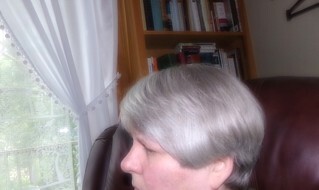 I’d gone a long time with a hairstyle I didn’t like, not in the summer anyway, too “long” and, therefore, too hot. I needed something a little shorter, and since I’ve always cut my own hair, today was the day. It’s a very exhausting ordeal for me. More so now that I can’t stand up for very long, so I put a stool in the bathroom where this job is accomplished, and I chopped away until there was hair everywhere, all over the sink, the floor, the loo, and especially all over me, down my shirt, down my back, and now I itch like mad. But I am not ready to take a shower yet so I will itch for today. It’s up past my ears in the front which is a big change for me lately and short in the back too. Oh boy it feels good though. What will happen is I will keep snipping at it every time I shower for a while before I get it all even, especially the back which is hard to do on one’s own. I have a 3-fold mirror in the bathroom so I can open the two end mirrors and see around back which makes cutting my own hair even possible. Otherwise I could never do it. 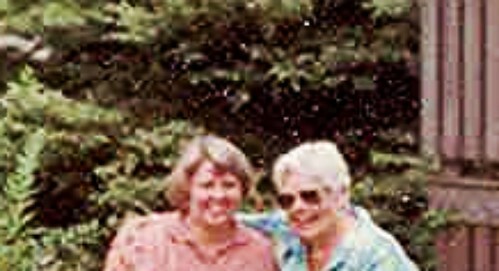 I just found this old picture of my Mum and me in the front garden here at CC. I am definitely turning into her… this was probably taken 20 or more years ago. (I cropped it and blew it up a bit so the quality is poor). Thanks for coming by with your thoughts, SP. You are too funny. Sheila, FYI, lives in the best spot in the world… the Yorkshire Dales. Lucky-duck! Don’t u have chiropodists over the pond? 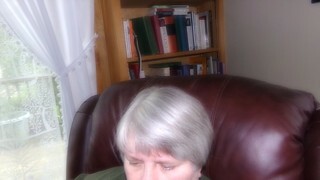 I’ll argue with God and have bought my next hair colouring box just today! Haven’t been to a hairdresser though for about 45 yrs! That was in Mallorca and I had it done Spanish flamenco dancer style. No I haven’t tried having Paul do anything to my hair. As it is, he has to cut my toenails because my hips won’t allow me to do it. He hates that job (I don’t blame him) but as for hair, no touchy… I can only blame myself if it goes wrong. TT, it feels so good now that I went ahead and got it shorter. I do that every few years anyway but hadn’t for a while. What a difference it is…love it. And it seems to stay clean for longer when it’s shorter, too. I’m also looking at getting my hair cut this weekend. It’s grown down over my shoulders again to about the middle of my back and it’s driving me crazy. Have you tried to have Paul straighten your hair? 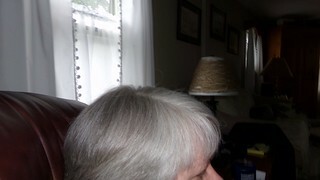 I wouldn’t trust DH to cut my hair but for the times I’ve cut it myself he’s been able to level off ragged spots. Fortunately we have a very inexpensive hair stylist here and it only costs $15 for a basic cut. Having been a hair dresser a long time ago I complement you on cutting your hair. I did it once and I learned from that lesson. I love your color too. I still have a lot of dark blonde in mine so the white isn’t as noticeable but it’s coming in. You’re a good stylist. (You should’ve seen my efforts, years ago, with a Hair-matic. Well, no, you shouldn’t!) Recently – like the past five years – I’ve let my hair grow and tie it back. Distressing how it gets thinner though isn’t it? I’ve noticed that myself. As for your no-dye policy, good for you. 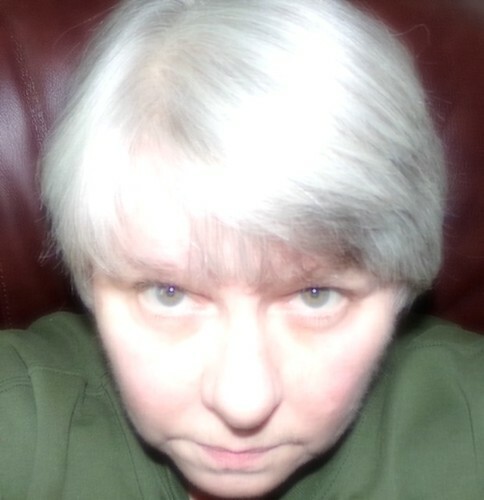 You are kind, Mags… my hair is baby fine and is thinning greatly – I really feel like a “senior” now with almost all my hair having turned white. Underneath it’s still sort of dark blonde but not much of it left. 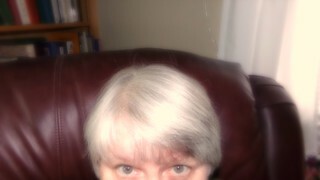 My mother had a head of white hair before she was 45 as did my grandmother. Mine has taken a bit longer but at 65 it’s pretty darn white, especially on the top. I don’t believe in coloring one’s hair either. I like a natural color. I figure if God thought that should be your color, then who are we to argue with that? Cute cut! Such hair, so full and such a beautiful colour.